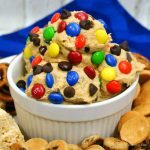 Loaded with chocolate chips, M&Ms and oatmeal, this Monster M&Ms Chocolate Chip Cookie Dough Dip is going to be a hit with your kids or at your next get together! Hi friends! Are you a cookie dough fan? Ohhhh I am. I’m one of those who can’t keep my hands out of the bowl when I’m making cookies for the boys. 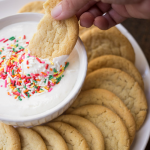 But guess what, we’ve come up with a way to eat your cookie dough – as a dip! 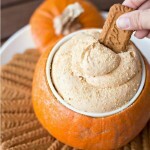 This is such a fun treat to serve at parties or as a special snack for your kiddos now and again. I get that it’s loaded with sweets so it’s not an everyday ordeal, but it sure is fun to make for special occasions! 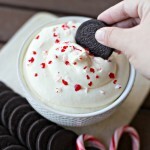 This Chocolate Chip Cookie Dough Dip is so easy to whip up! Using your mixer, beat the cream cheese, butter, and peanut butter until smooth. Then in a large bowl, combine the powdered sugar, brown sugar, flour, rolled oats and vanilla. At that point you’re going to want to gradually mix in the dry ingredients with the cream cheese mixture. Just set your mixer to low and slowly pour in. 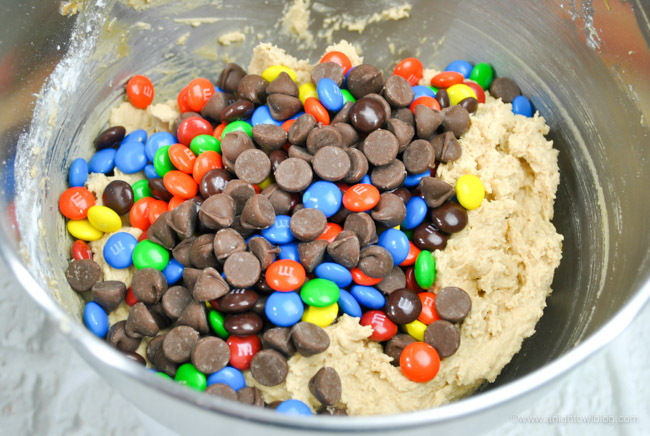 Once that’s all combined stir in the M&Ms and chocolate chips and you’re done! 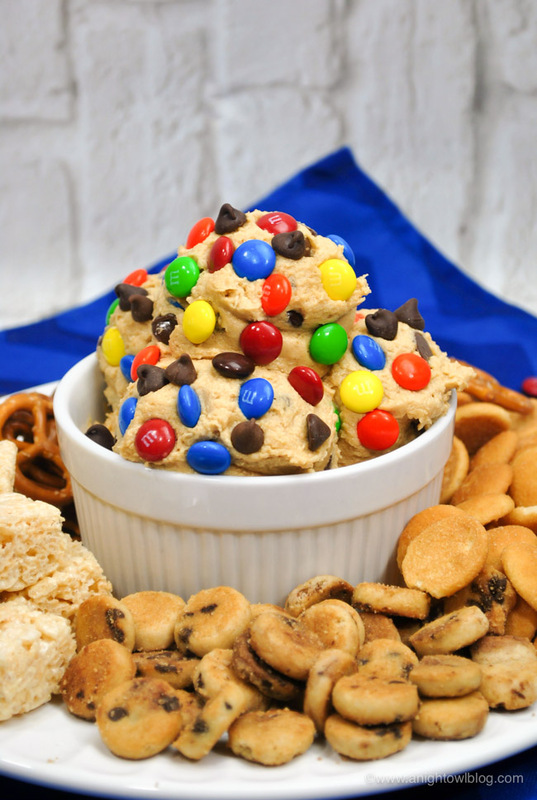 Store your Monster M&Ms Chocolate Chip Cookie Dough Dip in the refrigerator until you’re ready to serve. Then when you’re ready to serve, especially if you’re serving the cookie dough dip for a party, just scoop it into a bowl and add some more M&Ms and chocolate chips to make it look extra festive! Then I bet you’re wondering, What do I serve with Chocolate Chip Cookie Dough Dip? And really, the sky’s the limit! Create a platter around the dip with fruit, pretzels, marshmallow treats, MORE cookies – be creative! 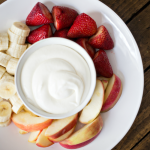 Honestly anything dipped in this yummy dessert dip will be a hit! Using a standing mixer, beat the cream cheese, butter, and peanut butter until smooth. In a large bowl, combine the powdered sugar, brown sugar, flour, rolled oats and vanilla. Gradually mix the dry ingredients into the cream cheese mixture. Stir in the M&Ms and chocolate chips.